One third of 12-member soccer team trapped in cave in Thailand for 2 weeks successfully rescued in daring dive through dangerous waters. Four children emerged from the cave where they had been trapped for two weeks, officials confirmed Sunday. The boys were the first members of the 12-member soccer team to be rescued after they were trapped deep in the Tham Luang cave by floodwaters. An earlier report that six of the boys had been rescued was later confirmed to be false. Chiang Rai Health Department Chief Tossathep Boonthong told Reuters that the boys were given "a physical examination" on the scene before being evacuated to Ciang Rai hospital. A helicopter was seen transporting several of the children to the hospital. 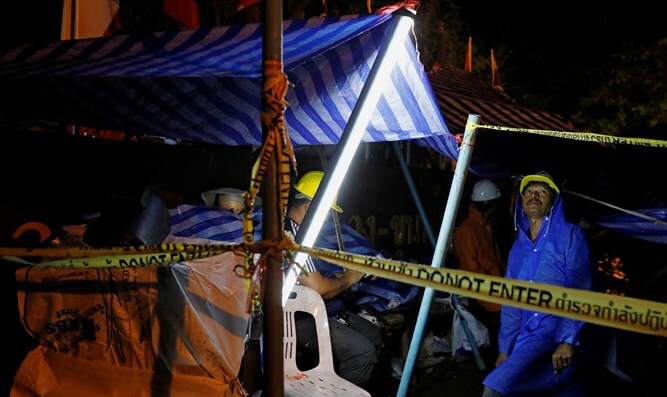 The 12 children and their 25-year-old coach had been trapped in the cave since June 23. A diving team first located the children on July 2, nine days after they went missing. A large-scale rescue operation was launched Sunday to bring the entire team out of the cave. The boys and their coach were given diving lessons in preparation for the dangerous journey through the treacherous waters. Five Thai divers and thirteen foreign divers are participating in the rescue mission. Each child is accompanied by two divers during the journey out of the cave, which involves swimming through narrow, dark tunnels with sudden turns and twists. The rescue was considered critical due to falling oxygen levels in the cave as well as the new rainfall which is expected this week and would cause the cave to flood even further. Acting Governor Narongsk Ostenkon, the commander of the rescue effort, said that Sunday would be "D-Day" for the rescue teams. The operation could take two-four days depending on conditions inside the cave. The danger the boys and their rescuers faced was underscored when a former Thai Navy Seal involved in the rescue effort died after running out of oxygen on Friday. The rescue was halted as night fell. Officials hope to resume the operation Monday morning.